Hey folks, if you walked into a Starbucks today (or perhaps even a record store), you might have noticed that The Beatles 1 is on the shelves again in a newly remastered CD format. The 27 song compilation of chart toppers was re-released today (Sep 13) with updated packaging and enhanced fidelity (the new disc features the critically acclaimed 2009 remastered recordings). The best-selling album was also released digitally on iTunes for $9.99 last week where it quickly shot to the top of the iTunes album charts in many countries including the United States, Canada, Japan, the Netherlands, Mexico, Sweden, Spain, New Zealand and Greece. Not too shabby for a band that has been broken since the 70s. 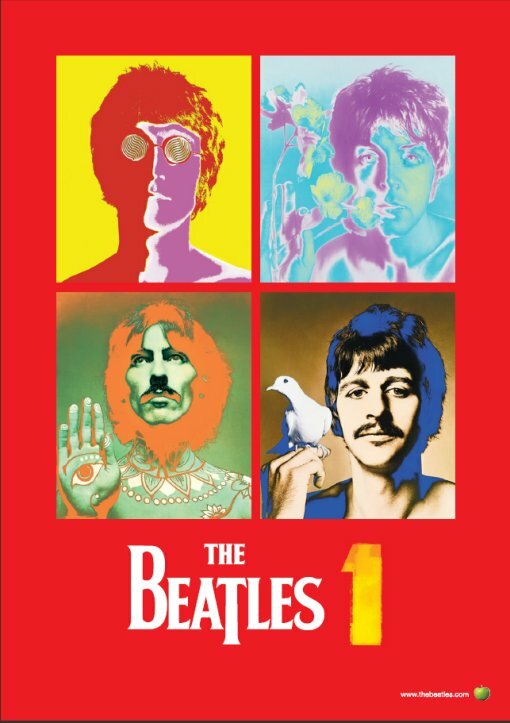 If you are one of the 30 or so million people that does not own this album, you’ll be happy to know that I’m giving away a copy of the newly remastered edition of The Beatles 1 on CD along with the fancy psychedelic poster you see above. Track list and contest entry form after the jump. Contest Rules: US entrants only, 1 entry per household, ends on September 18, 2011 at midnight. Tweet or Like this contest on Facebook to increase your chances of winning!